Our Products >> SPG Lube Black Powder Cartridge Reloading Primer- NEW 9th Ed. The new 9th Edition contains chapters: Reloading The Match Cartridge, Black Powder in the 32-40 & 38-55, Sorting Out That New Rifle, and Match Strategy, all written by the Multi National Champion Steve Garbe. This is it…the standard reference work for loading the black powder cartridge rifle. Written by 4-time National BPCR Silhouette Champion Steve Garbe and world-renowned gun writer Mike Venturino this is the first and only guide you will need to successfully reload black powder cartridges. The Black Powder Cartridge Rifle Primer takes off from the point that the reader understands basic cartridge reloading but doesn’t know the specific techniques uniquely associated with black powder reloading. It walks the reader through the basic techniques such as powder compression, setting up over-all cartridge length with specific bullets, fouling management, bullet alloys, correct sizing, wads, drop tubing powder, bullet seating and case cleanup. There are specific chapters written by Steve Garbe on loading the match cartridge and a special chapter on loading the popular .32-40 and .38-55 cartridges for best accuracy. The authors have included a chapter on how to pick the best black powder cartridge for your needs. Twenty-two different black powder cartridges are listed with specific sample loads that will get you on the road to optimum accuracy in your BPC rifle as well as ballistic charts for bullets from .32 to .50 caliber. There is also an equipment listing that puts you in the loop on where to find supplies for black powder reloading. 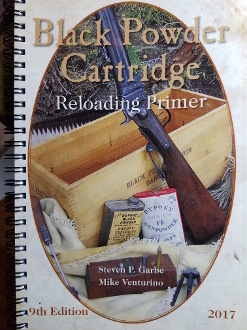 There are many other manuals dealing with the topic of black powder cartridge reloading but none backed up by the practical experience and match-tested techniques that Steve Garbe and Mike Venturino have acquired over their many years of competing and hunting with the BPC rifle. It consists of 124 pages, 60 photos, and numerous charts, spiral bound in tough “shop-proof” paper designed to lie flat on your reloading bench and will last for many years. Guaranteed to be a constant source of reference and simply “just the facts” on black powder cartridge reloading. Canadian & International orders - please contact us for shipping prices. SPG Lube Black Powder Cartridge Reloading Primer- NEW 9th Ed.